I have to admit that I didn’t make it to as many First Bite restaurants as I would have liked this year (unfortunately only two…but hey, do you think I just go out to eat for a living?). Those I did visit ran me through the gamut of diner emotions: happy, sad, disappointed, satiated, and–most importantly–ready to go back (…to one sooner than the other). We decided to go to Arugula with a small, cozy group of friends (ha. Ended up being 10 of us in our party). If you’ve been to Arugula, you know the space–fairly small, many tables on the floor, white tablecloths, warm decor. (No that rhyming was not intentional). We had made reservations five days in advance, and yet we still had to wait 35 minutes before our table was ready, which was not the most pleasant start to the evening. So we decided to go have a drink at the bar to wait. When we squeezed up to the bar (standing room only for most of us), the waitress (or was it the hostess?) warningly told us to be careful not to lean into the booths behind the bar. Um…ok. Thanks for the obvious and not-so-helpful hint. Then, to top it off, the bartender was sub-par. He didn’t even look at us when we were standing there (obviously making eye contact, ready to order drinks), and it finally took some leaning over the bar to get his attention and ask if we could order some wine and cocktails (“Could you please serve us so we can willingly hand our money over to you? Thanks.”). When we finally got to our table, the service there was much better. Our waitress was attentive, and helpful with choosing which bottles of wine to order. The First Bite menu was actually quite extensive, with seven to ten options for the first, second, and third courses. Although the portions were fairly small, the food was generally good; some of it was forgettable (beet salad, octopus carpaccio), and some of it lick-the-plate delicious (endive salad, sea scallops, Alaskan cod). Consensus: would go back to give it another try, but wouldn’t sidle up to the bar again anytime soon. Oh, and also wouldn’t plan on being seated in a timely manner (although that could have been a result of our large party…but should that matter?). Overall theme for the night: cozy atmosphere, good food, balanced portion sizes. Much smaller group this time (two), which led to a more pleasant experience in my opinion. The atmosphere of Colterra was actually really cozy and comfortable. It’s located in what looks like an old house (or a couple of them joined together). There are multiple dining areas, so all of the diners aren’t squished into one room. And, although the bar is small, there is space at it to both sit and stand. I could tell this was going to be a good place when I looked at the menu and wanted to order all of the selections on it (even the specials our waiter mentioned that weren’t on the menu). 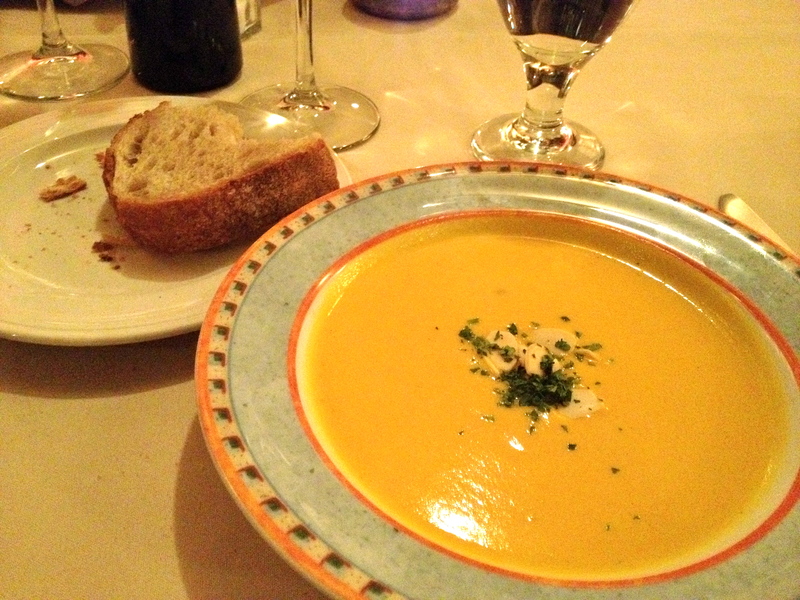 The salad appetizer left a bit to be desired in the flavor category, but the local pumpkin soup was delicious. And it didn’t taste like baby food–one of my pet-peeves about some pureed soups (how do I know what baby food tastes like? Well…that’s fodder for another blog post). Main courses were exceptional–the duck confit was flavorful, not too greasy, and its accompanying spaghetti squash, greens, and winter fruit compote were just the right amount of salty, sweet, and tangy to cut through the richness of the duck. The seared ahi tuna was also delicious and well cooked–my favorite part was the combo of the tuna with balsamic brown butter sauce. Yum. So good we had to dig in before the photo-op. as one of the three courses, and Colterra did). 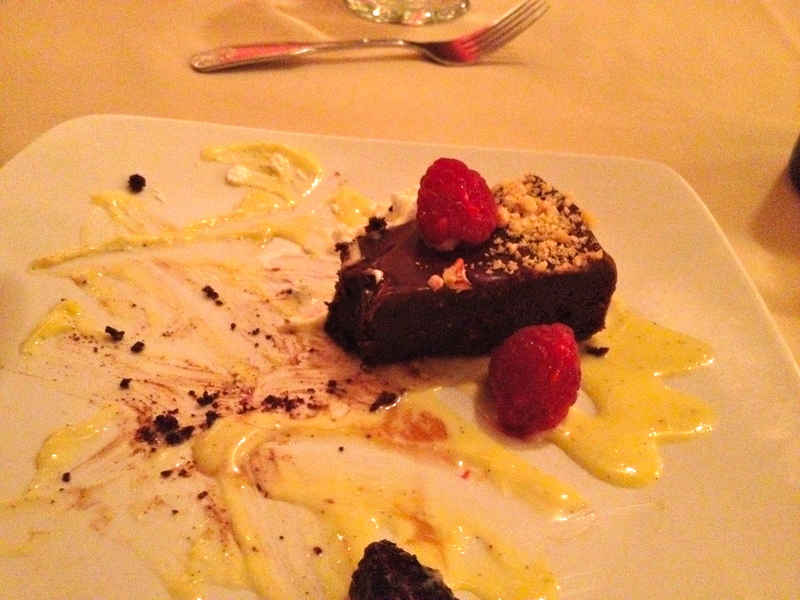 In my humble opinion–which you can take or leave–dessert is better than another savory course. There. I said it. For me, if I get dessert at a restaurant, it saves me from going home and having to dig out a spoon for a scoop of Ben & Jerry’s or rifling through the pantry for a piece (or two…or four) of chocolate. Colterra’s desserts were good, but not great. The rich, dense, not-too-sweet chocolate hazelnut torte won out over the flavorful-but-a-little-on-the-dry-side caramel apple bread pudding. I like my bread puddings with a good amount of sauce (whatever flavor it may be), and this was definitely lacking. Consensus: Definitely bookmark this one as a place to re-visit (when I feel like driving to Niwot). Great place for a date night.